Hummmm….What to Wear…What to Wear? Today’s verse was “Saul, Saul, Why are you persecuting Me?” It’s not often that I stop to consider that this verse could apply to me today and that there are times Jesus could say the same to me. I have been a very zealous Christian–hopefully in my past. I put on the whole armor…Exacting, judging, and spewing words like, ‘you have to do this, keep that, or else!’ (Warning the wayward in the name of Jesus) Along with that came an expectation of being ‘persecuted’ because I was such a good Christian, which gave me all the more reason to keep my guard up and armor on. I was an independent warrior for Christ, like Paul, not realizing that all the while I was persecuting the One I was claiming to represent. The second verse was also Jesus’ words, “Take my yolk upon you and learn from me…” I’ve always thought a yolk would be restricting…always tied to something. Never able to be independent…yolks were not for me. And then I began sketching and thinking about the fundamental differences. 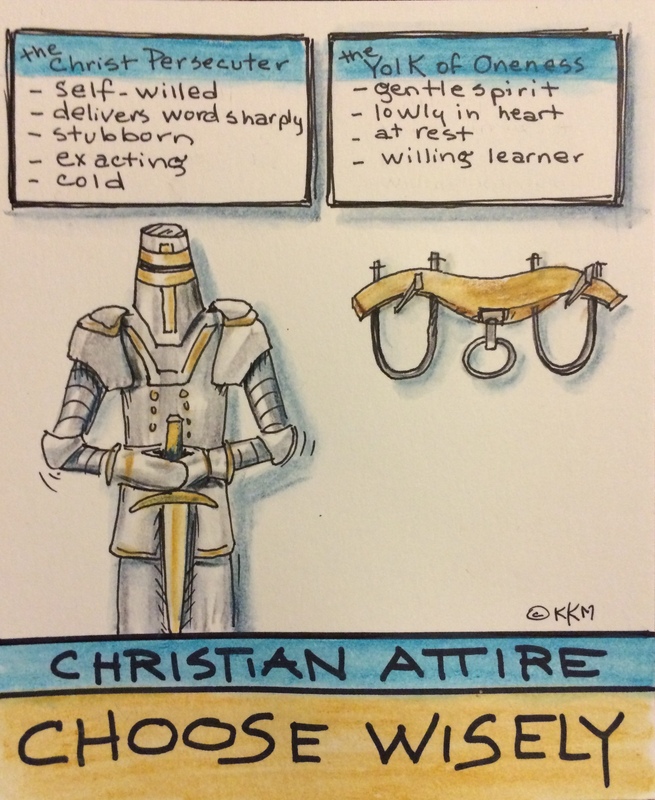 Yes, armor is for an individual but in many ways it is much more restricting and dangerous. You can’t look over your shoulder, your focus is narrow, you can only hear certain things because of all that metal on your head, you look strong but you’re not, (that’s why you wear armor) you can only eat or drink what fits through the narrow slit, if someone tips you over you can’t get back up, (which in my minds eye is very humorous)…the list goes on. With a yolk you have full range of motion, you can see what’s coming, there’s always someone by your side, you can even eat and drink what you want, when you want. If you go astray there’s someone there to gently guide you back to where you should be and there’s no cow tipping when you’ve got your yolk on–because we are one. I don’t think I have to think further…I’m wearing my yolk today. What will you wear?